Check out the countdown to my trip to Ecuador in August 2014 above. I will be co-leading a trip with local Ecuadorian birder Edison Buenano for Wildside Nature Tours. You can read about the trip and sign up here. Speaking of signing up, you only have 38 days left to register–registration closes Thursday, April 10, 2014 (120 days before the tour begins on August 8, 2014). We will be in Ecuador for over 2 weeks and will stop at some of the premiere hotspots in Ecuador including the Cloud Forests of the Western Slope, the Andes Mountains, and the Rain Forests of the headwaters of the Amazon in the East. Ecuador has a list of birds over 60% larger than the list for North America and it’s only about the size of the State of Colorado. It also has over 4,000 species of orchids. 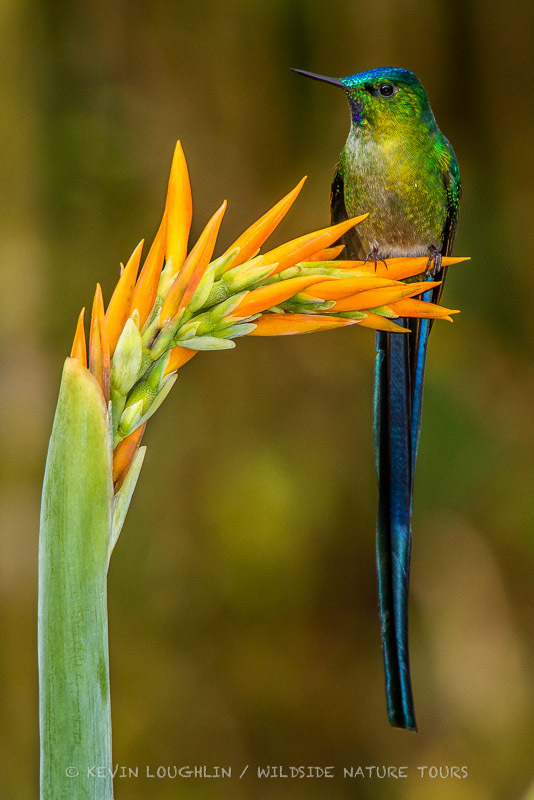 And with all those flowers, this small country is home to more than twice as many species (133) of hummingbirds as Costa Rica (54) (see Hummingbird Checklists by Country). Of course, there are some types of birds that are hummingbird-like. Others include these in hummingbird totals. That would make this little country #1 with 163 species! (see AvianWeb Hummingbird Distribution). At any rate, the hummingbirds deserve a mention all by themselves. But with this incredible bird diversity a birder can be faced with a daunting task of trying to learn the birds of Ecuador or merely trust whatever the guide says. Either way, your experience will be less enjoyable if you do not know what to expect. There are a number of locations listed on the Wildside Nature Tours site as well as a few target species. Wouldn’t it be nice to know what birds we are most likely to encounter? We now have some help via eBird (eBird.org), a Citizen Science project that collects birders’ checklists in an online database from around the World. I have identified 11 of the best sites we will be visiting and downloaded checklists for the month of August for all the sites. I made arbitrary divisions into 4 groups: 1) Common–the most often reported birds occurring on birders’ checklists; 2) Fairly Common; 3) Uncommon; and 4) Rare–the least often reported birds for those 11 hotspots. The list below was culled from this master list and lists all 240 species that occur in Group 1: Common for one or more of the sites we will be visiting. The number behind the species name indicates the number of chances we will have to see each species based on the eBird reports for these locales. This list is not in taxonomical order. It is listed in descending order of the number of locations that each species can be found. Note that even if a bird has the number (6) following its name that it does not mean that it will be Common at all 6 of those sites. It merely means we will have 6 chances to see the bird and at least one of the sites the species will be commonly reported. Click on a species name and it will take you to Cornell’s Neotropical birds website. Links are given for most of the species here. A caveat–this is not a guaranteed list. This is merely a list of what has most commonly been reported to eBird so far. This list does help us with what we probably will see. More lists will come. This is just the first list. These are the birds one should focus on learning as a first priority. Building your birding confidence to go to a new location will help you enjoy your experience more! Take a few at a time (maybe 2 or 3 per day) and learn them well. By trip “Go time” you will be prepared to for a trip of a lifetime! Hi Greg, it wouldbe fun to go with you toEcuador. I,m really thinking about it. We just got back from our trip to Southeast Asia. Thanks to the lists you culled for me from ebird, which I studied and made notes on in my field guide, we were able to identify 165 new species mostly on our own. We normally do not go on birding tours preferring the thrill of discovery on our own. But with you on the tour it sounds like it would be a lot of fun. Hi Joan! I’m glad you had a good time in Southeast Asia and I am happy I was able to help. It sounds like it was a really fun trip! And yes, we are going to have a blast in Ecuador! I would love to have you both along for the experience! This is awesome Gregg. I reviewed eBird and thought it would be a piece of work to get all the data organized!!! Thanks. I will use this to study the birds before I join you in Ecuador. Looking forward to this trip. Hi Sue! Glad this will help. And the Ecuador trip will be EPIC! We are going to have a blast!